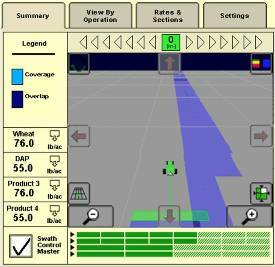 John Deere Section Control (formerly known as Swath Control Pro™ software) is a software activation on the GreenStar™ 3 (GS3) 2630 Display. 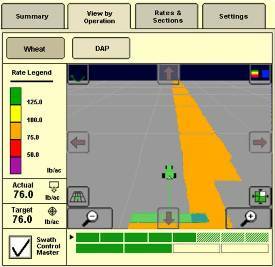 John Deere Section Control automatically controls the sections on an implement. When John Deere Section Control is enabled, it utilizes global positioning system (GPS) information to turn implement sections on and off and reduce overlap in previously applied areas. It also can be used to reference interior and exterior field boundaries. John Deere Section Control automatically controls the implement sections as the implement passes through defined boundaries. John Deere Section Control can be used to turn sections on and off at an exterior headland boundary before the headlands have been applied. This allows the producer to apply the product application last, after the main portion of the field has been applied. A 15-hour demo activation for John Deere Section Control is included with the GS3 2630 Display. 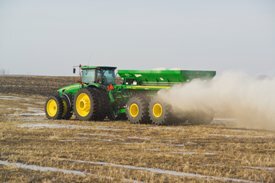 John Deere Section Control improves efficiency for producers. One of the primary benefits of Section Control is reduced product overlap in the field. Overlap reduction decreases the total amount of product used in the field to save the producer money by lowering the input costs for the farming operation. The reduction of overlap can also improve the yield. Some crops are very sensitive to excessive seed population and product application. These crops typically yield less in overlapped areas of the field where the seed population is too high. 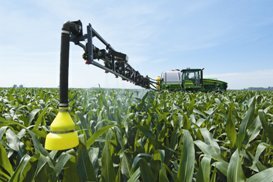 Some crops can be easily harmed by excessive chemical or fertilizer applications that negatively impact the yield potential of the crop. 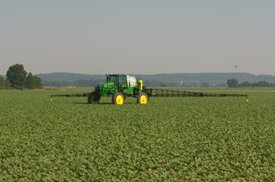 John Deere Section Control reduces overlap and helps the crop achieve its highest yield potential. John Deere Section Control also reduces the stress level of the operator. By utilizing Section Control, the operator does not need to focus on manually turning the implement sections off and on. This helps reduce fatigue and enables the operator run longer hours in the field. It helps less experienced operators more accurately perform the product application in the field. ISOBUS compliant implements utilize the GreenStar™ 3 (GS3) 2630 Display as a virtual terminal that serves as the operator interface for the implement. The GS3 2630 Display and John Deere Section Control are capable of automatically controlling the sections on ISOBUS-compliant implements. The John Deere Section Control activation can automatically control the implement sections on John Deere equipment and ISOBUS-compliant equipment without the need of a separate activation. The functionality of the ISOBUS implement needs to be verified to ensure compatibility. Raven is a trademark of Raven Industries Incorporated. John Deere Section Control on the GreenStar™ 3 (GS3) 2630 Display can simultaneously control implement sections on multiple product operations. The GS3 2630 Display, with John Deere Section Control, can automatically control up to four different sets of implement sections on equipment capable of applying or performing up to four different products and operations. Each product application or operation (set of implement sections) can be configured with their own turn on and off times to allow for different application or control points on the equipment and for different product types. The number of sections for each product application can be different from the number of sections for the other product applications on the equipment. The ability to control equipment with multiple product operations provides producers with the capability and flexibility for applying multiple products with a single piece of equipment in one pass. 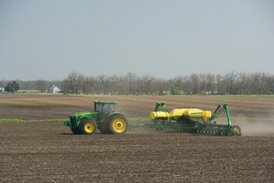 John Deere Section Control is versatile and adaptable. It can be used on a variety of John Deere and competitive equipment to provide producers with the benefits of John Deere Section Control throughout multiple operations and seasons. 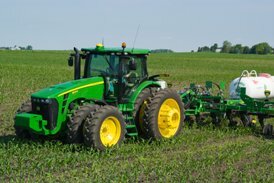 Implements like NH3 applicators, planters with the Tru Count Air Clutch® system, and dry box spinner spreaders may require the use a GreenStar Rate Controller or GreenStar Rate Controller Dry. 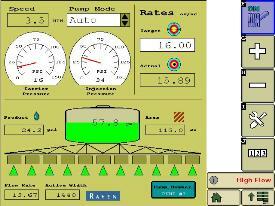 The Rate Controller serves as the interface for the GS3 2630 Display to control the sections on the implement. Tru Count Air Clutch is a trademark of Trimble Navigation Limited.